Opening Day Cards - Baseball Cards & Baseball News: Are the Brewers Leaning Into Pitches? I'm not saying that they do it all of the time but I have started to notice that at times they dont just try to lean in on it they actualy almost fall into to them. I mean just look at that picture above I know Prince is a big guy but it doesnt even look like he is trying to get out of the way. Really it looks like he is trying to backhand it. 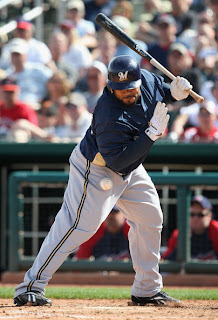 3.Fielder).Fielder just gets hit because people get mad when people slam homers off of them.I know i do....Weeks is a plate crouder but I think It's intenntionly.The good thing with those two is that at the same time there having wonderful seasons! I think it's a little of both.The Brew Crew has upset some opponents with their behavior,so a little retaliation is to be expected.But I've noticed they do also lean into them from time to time too.Then again,the same could be said for at least one player on just about every team! Some solid insights. Ben I agree - if they are going to lean in they might as well throw some pads on, be smart about it. I mean Fielder shouldn't get thrown at.There just trying to hurt him because the Cards already have Yo on the DL(But that doesn't matter because he's starting tonight!! ).I mean Weeks is really sstarting to get hot(3 homers in the lat 4 day and he has 5 RBI's in that stretch).Fielder is know leading the N.L. with 23 homers while Weeks is in 9th with 18.I'm just loving it that when somebody hits a brewer they're starting to get tossed! Weeks just went deep on a 3-2 pitch.Now you see what happens!!!!!!!!!!!!!! Yeah, as Ben said, maybe it isn't a great idea to throw at these guys. In one of our first episodes I predicted a big year for Rickie Weeks and I am starting to look intelligent (for once). In the last 10 games he has 5 HR, 11 RBI, 12 R and a .325 average. That brings him up to 20 HR, 64 RBI and a rising .274 BA this season. Not a bad line for a leadoff man who also leads the league in leading off the game with a HR.